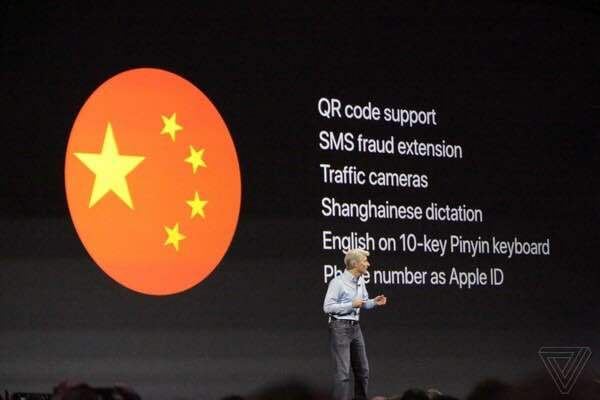 While Apple did talk a lot about China, almost completely glossed over at the announcement (taking up less than 30 seconds in a 2.5-hour presentation), were some very interesting feature additions to iOS 11 for Chinese customers. Will this be enough to shore up their defenses and decrease their rate of market share loss? Here’s a quick breakdown of the features and what it could mean for customer gain and retention in China. TL;DR: Many of these features have existed in China for some time; Apple is just playing catch up. While QR codes have been a bit of an oddity in the West, they have exploded in China. Remember, it wasn’t until recently that URLs could actually have Chinese characters in them. To combat this, many Chinese sites used long and almost indecipherable combinations of letters or just resorted to numbers. QR codes were a great way to reduce the friction and, as we have seen since, are now used in super interesting ways, including possibly AR. While many Chinese apps now have this functionality, Google only just introduced it into Android last year via Google Now. As noted in the China Tech Talk podcast, Apple’s China woes boil down to non-existent or completely irrelevant services ecosystem. The introduction of QR code support shows that Apple is taking this weakness seriously and could see users choosing the native function over the myriad options they have in various apps (there is a very strong counter-argument to this, but for the sake of brevity, I will leave it out). This feature had a lot of people shaking their heads in confusion as the slide itself is quite confusing. However, Redmond Pie has a good breakdown of the new features announced and one of those is traffic camera alerts in China. This is a feature present in almost all Chinese map and navigation tools. It is rare to see a Chinese police officer giving tickets; instead, the state relies on traffic cameras to dole out fines and punishments for traffic violators. CCTV cameras of all types are ubiquitous and are seen as a way to increase safety in a country with an unreliable police force. China, from the outside, may seem homogenous. However, the opposite is quite true. Not only does China have 57 distinct ethnicities (the main one is Han), but almost every part of China has its own dialect, ranging from slightly different vocabularies to almost completely alien languages. Mandarin, the official language, is commonly spoken across the country, but areas like Guangdong, Hong Kong, and Shanghai have held tight to their heritage. Sharing some similarities, it can be difficult for a Mandarin speaker to read or speak these two dialects (Cantonese in Guangdong and Hong Kong, Shanghainese in Shanghai). iOS has supported Cantonese voice input for some time, but the introduction of Shanghainese could provide some needed help. Shanghai is a very affluent city and arguably one of the most international. If Apple can gain in this market, their market share could be bolstered. This is another feature that is highly prevalent on many China keyboards available for iOS and Android. This inclusion means that users may be less likely to switch to a 3rd party keyboard. However, they have other reasons to do so anyway, including dictionary migration from Android and better prediction that includes internet slang. This is huge. As with the PC, China has pretty much skipped over email with many local email providers innovating little on the experience. Now, with WeChat, there is very little reason to use email for regular communication and many people may never have even created an account. What everyone does have, however, is a phone number. In China, phone numbers can be used to register for almost any online service and are typically used to also verify accounts, for both registration and security. For service providers of all types, the phone number is actually preferable: China has gotten serious about real-name registration and phone numbers are the most basic. In order to access social networks, buy train tickets, and make payments, your accounts need to be tied to an ID. The Chinese government has put a lot of time and effort into ensuring that phone numbers are tied to IDs with very few SIM cards now not tied to an ID. For businesses, including Apple, this is a boon: with a phone number, they can be reasonably sure that the user is who they say they are. These new features will make users think twice before switching their primary phone to a local one. These iOS features, however, are not enough to stem their continued market share decline. They need more localized services and, more importantly, they need a completely separate China strategy.